A North African twist on a classic dish! This spicy potato salad, inspired by my favourite North African spice, has the perfect amount of zing and spice to it and is ridiculously easy to make, you could make it with your eyes closed! But don’t. Because it involves cooking on a stove top, which could end in disaster! First post as ‘The Home Cooks Kitchen’! 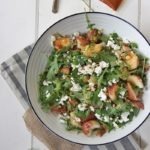 So today I thought I’d start off again by saying, thanks for dropping by, and hey check out this wicked salad recipe! I love a good salad! Who doesn’t? I also love eating carbs, which is why this spicy potato is a match made in heaven! Despite the fact that is has potatoes in it, it is actually quite a light and fresh salad! I have had an obsession with harissa for quite some time. In fact for a while there, I have posted at least two harissa recipes in a row! My other favourite salad, and my new favourite savoury snack! This spice though is just so damn versatile! Harissa is an aromatic chili paste that is used often in North African cooking. It comes either in a paste form or powder form, and adds the perfect amount of spice to any recipe. It usually includes ingredients such as chili, cumin, garlic, and coriander/cilantro to make a blend that seriously packs a punch! Harissa can be used to enhance any dish really, I love adding it to lamb as a rub with olive oil, or add it to soups to spice it up a little bit. It also mixes into a beautiful dressing for salads, with a little olive oil and lemon juice. 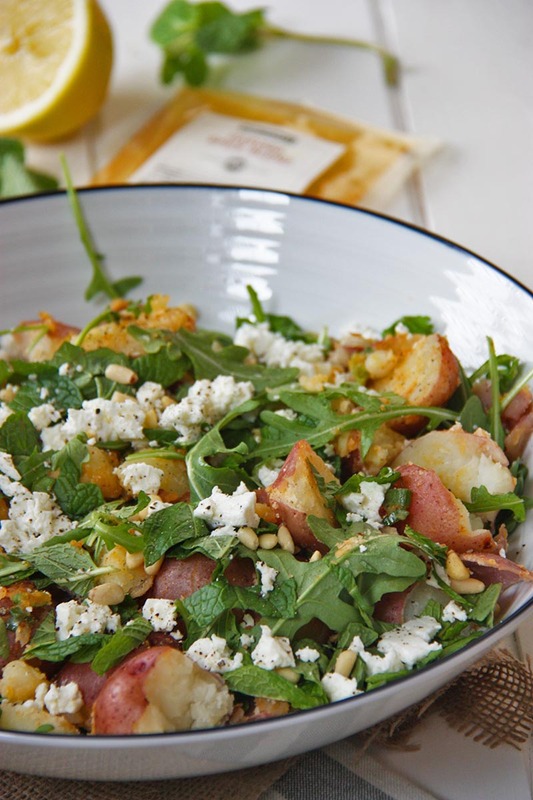 This spicy potato salad was inspired by a love for miniature potatoes! They are just so sweet and cute, and heavenly to bite in to. I love that you don’t need to do anything fancy with them either, just whack them in a pot and boil them until they’re ready! Ta-da!!! I have been doing a lot of research over the past two weeks, carefully trying come up with new ideas and let’s just say, that I am so excited to be back on the blog again, creating some new, amazing recipes for you! So bring on the New Year! And new blog! 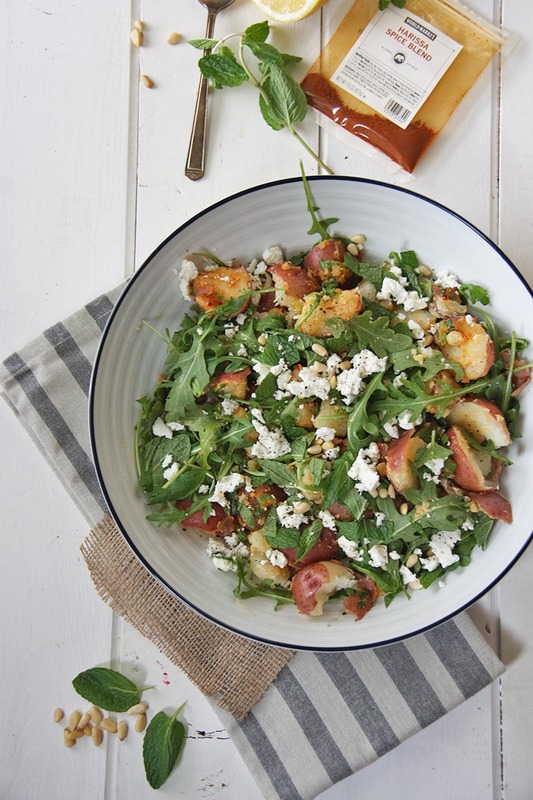 Love a salad that packs a punch? 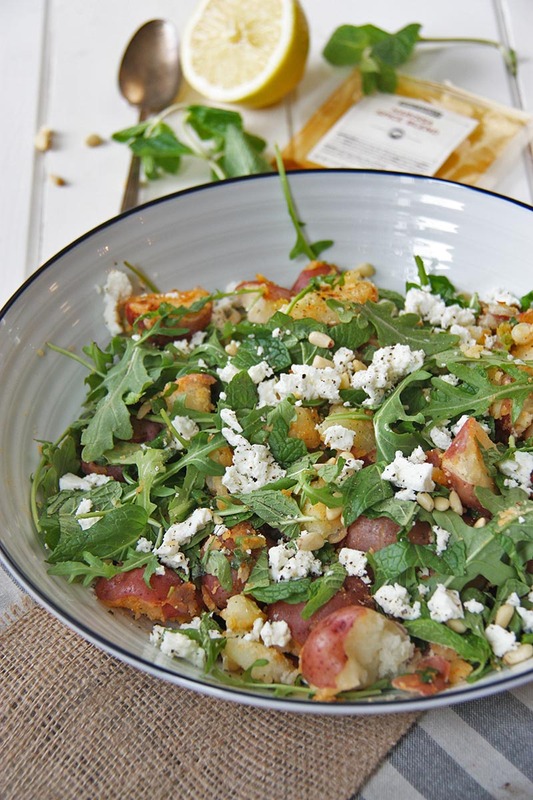 Try this spicy potato salad inspired by one of my favourite North African spices - harissa. This recipe is so easy to make, requiring just 10 ingredients! Cook potatoes - place potatoes in a pot of cold water, and bring to the boil. Boil 20 minutes, or until potatoes are tender. You know they are cooked when you can stick a knife in them and the knife goes straight through. Combine harissa spice, olive oil, salt and pepper and lemon juice in a small bowl and whisk until combined. Once potatoes are cooked, drain water and roughly chop potatoes in half. Add harissa mix and spring onions/green onions to potatoes and stir. In a large salad bowl, lay out arugula/rocket. Top with potato mix and toss. Add fetta, mint and sprinkle over pine nuts. Note 1 - in Australia, the tiniest potatoes I would use would be chat potatoes. In America, I use the smallest potatoes I can find. Baby red potatoes work a treat, or any others that you can find! We have some beauties here that are mixed colour which are wonderful. If you can't find small potatoes, use a red potato like a russet and just cup them into halves or quarters. Note 2 - harissa is easy to find in most supermarkets. In Australia, Master Foods have a harissa spice that is found in supermarkets. In America, I found mine in World Market. If you can't find it, I might suggest using a spice mix of cumin, coriander, cayenne (just a smidge) and paprika. I haven't tried it, but these spices marry well together. Note 3 - I'm really bad at measuring things like salad leaves! About 3 decent sized handfuls should be enough, but it really depends on how many people you are aiming to feed or how many leftovers you want!